How Solar Hot Water System Works? - Sinoyin Solars Co.,Ltd. You are here: Home » News » Technical » How Solar Hot Water System Works? How Solar Hot Water System Works? A solar water heater traps sunlight in a water sensor that heats the sanitary water. It is a simple and old system, now produced in series. A sensor of a few square meters oriented towards the south allows to heat the sanitary water and to save some of the energy used by the inhabitants. a system for circulating the water between the sensor and the balloon thanks to automatic regulation. As soon as the sun cast rays on the panel, the temperature of the absorber contained in the solar thermal panels rises and transmits its calories to the coolant (or water in the case of a Monobloc water heater). The heat transfer fluid loses heat to the benefit of the water stored in the tank is colder spring and exchanger (coil where to place the exchange) with a few degrees lower to join the panels where it will regain degrees lost. This temperature difference does not need to be very important to ensure a good heat exchange. 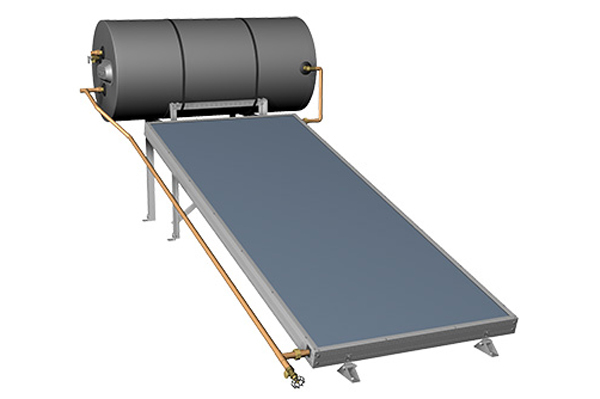 The typical regulation of a solar water heater, will maintain the circulation of heat transfer fluid with barely 3 to 10 ° difference. As the morning hours advance, the temperature of the water stored in the flask around the heat exchanger (the coil) heats up. Simultaneously, the heat transfer fluid that cools less, as it passes through the balloon, while the sun begins to heat up more, sees its temperature rise. At noon, the temperature reaches 50 ° C. If we use hot water, the balloons are made in such a way that we draw the upper part of the balloon, which is compensated by the cold water coming in the lower part. So we do not burn ourselves and the newly introduced sanitary water warms up quickly in contact with the exchanger. During the afternoon, if the sun is still there, the temperature can still rise in the absorber, up to 70 ° C in general. Beyond this, the electronic regulation of the solar panels will stop the circulation of the coolant to avoid overheating. Solar panels are always exposed to solar radiation, and the temperature of the coolant will continue to rise in temperature. To avoid boiling and because there is expansion of the coolant, an expansion tank is installed on the circuit. When the evening arrives, with the sunset, the solar panels cool progressively. When the temperature of the coolant drops below that of the balloon water, the electronic control stops the traffic until the next day (traffic which had resumed at the end of the afternoon). During the night, the ball will gradually cool down. The cooler water will slowly sink to the bottom of the balloon waiting to be reheated by the exchanger the next day, with the warmer water remaining available at the top. A solar water heater uses the physicochemical properties of the exchange of calories and the expansion of liquids, thanks to a flat glazed sensor, which serves as an amplifier for the exchange of calories provided by the sun.